DRIFT provides interactive cinematic experiences by creating events with a difference; showcasing iconic, cult and current films in unique environments. DRIFT was born from a group of filmmakers thinking about the lack of outlets in Manchester for rising artists, so a priority of ours is to give people a chance to exhibit their own work, and provide regeneration for the artistic community. Throughout 2013 we have the first group of DRIFT events; with the first planned for 1st March, at the Central Methodist Hall auditorium, a little hidden secret of Manchester’s Northern Quarter. 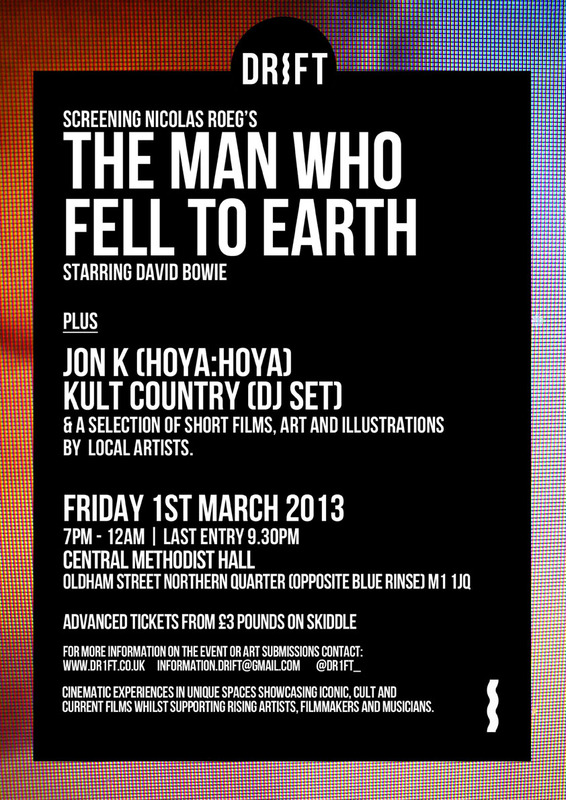 The first screening will be of Nicolas Roeg’s ‘The Man Who Fell To Earth,’ starring David Bowie, to coincide with the release of Bowie’s new material. The evening will be a celebration for the artistic community; as well as films, we also have illustrators and artists exhibiting their work in the venue; as well as having a strong musical influences with Jon K (Hoya Hoya) coming to spin some tunes, as well as a DJ set from previous Now Wave headliners Kult Country.